Even though hydroponic systems use scientifically optimized man-made nutrient solutions, Nick Savidov makes the claim that aquaponic plants are healthier, and more nutrient rich than those from hydroponic production. He says this is possibly because of the complex microbial communities present in aquaponics stimulate root growth and nutrient uptake in ways we still do not fully understand. A new paper published by the Aquaponics Association delves a bit deeper into this subject. These microorganisms are responsible for nutrient-delivery, disease-suppression, and environmental regulation. The positive results include healthier roots, less spoilage, and more nutritious produce. I am very disappointed to see such misinformation being published. Hydroponic crop production is not in any way "sterile," but rather utilizes a very diverse microbiological nutrient solution. 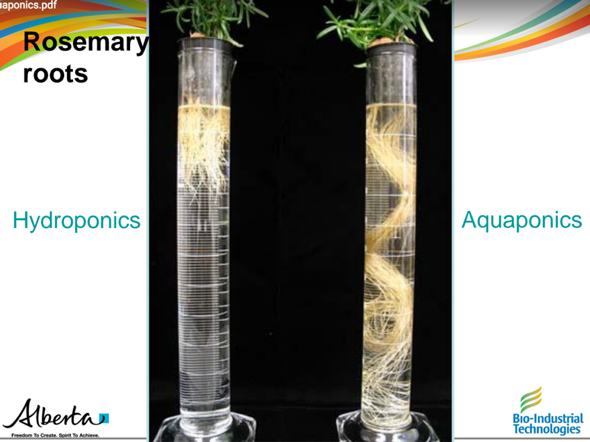 Dr. Savidov's photos of "hydroponically grown" plants are not in any way an accurate representation of plants grown with hydroponic techniques. To describe aquaponically grown produce as more "nutrient rich" and that they are "healthier" or "more productive" is patently false. I have been a grower and consultant for over 30 years and have consulted for both hydroponic and aquaponic growers worldwide.